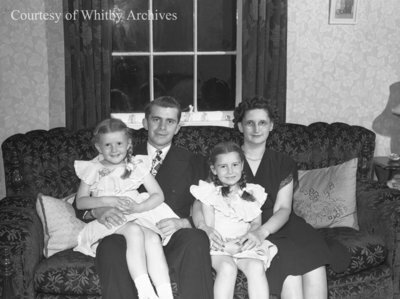 A black and white large format negative of Allan and Audrey (Powell) McKenzie and their two daughters. This photograph was taken for the 35th wedding anniversary of Elmer and Adella Powell. Elmer John Powell was born at Pickering Township, Ontario on 7 July 1889. He married Adella Lariene Richardson at Pickering Township on 4 June 1913. He died on 28 June 1972 and is buried in Mount Lawn Cemetery, Whitby, Ontario. Adella Lariene Richardson was born 18 May 1890 at Whitby, Ontario. She died on 4 September 1983 and is buried in Mount Lawn Cemetery, Whitby, Ontario. Elmer and Adella had 4 children: Audrey Ethel (1914-1964), Russell Elmer (1918-2004), Kenneth L. and Vernon John (1926-2012). Ruddy, Marjorie ; Powell, Elmer John ; Powell, Adella Lairene Richardson ; McKenzie, Audrey Ethel Powell ; Powell, Russell Elmer ; Powell, Kenneth L. ; Powell, Vernon John ; McKenzie ; Allan C.
Powell 35th Wedding Anniversary, June 4, 1948, Marjorie Ruddy. Whitby Archives A2013_040_371.